The purpose of the Library and Documentation Centre is to provide artists, researchers and the general public with access to the entire body of information on contemporary art. 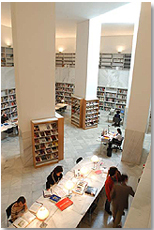 The Library houses an extensive collection of documents in all media from 1950 until today, on Spanish and international art, with special reference to the fields of Visual Arts, Architecture, Design, Photography, Film, Video Art and the creative application of the New Technologies, as well as monographs on museology, museums and other areas of art-related knowledge such as philosophy, sociology, communication, etc. The Library also has an extensive collection of reference works (dictionaries, encyclopaedias, bibliographies, etc). Initially based on the bibliographic collection of the Museo de Arte Contemporáneo de Sevilla, the Library adds to its holdings by three methods: purchases, exchanges of publications with comparable Spanish and international institutions, and donations and deposits (it includes donations from the library of José Ramón Danvila, from the sculptor and painter Rolando Campos, and from Equipo 57, as well as deposits such as those from Paco Molina or the Escuela de Estudios Hispano-Americanos). At the present time the Library has more than 30,000 monographs, 206 periodicals, of which 60 are subscriptions, 1,980 posters, 1,700 CDs of contemporary music and 700 audio-visual DVDs. The acquisitions policy places special emphasis on works related to artists who form part of the CAAC Collection, and the Library has also launched a new initiative to build up archives on artists and/or art movements such as Equipo 57 Team or Grupo Afal. It has also recently initiated a policy of acquiring artist's books. · Monday to Friday: 9:00 - 14:00 h.
* Saturdays, Sundays, Holidays and December 24 and 31: closed.